Locale Emulator - Yet another tool for Windows language and region simulation. Locale Emulator is a tool for Windows 7 and 8/8.1, which can provide the same region simulation feature like NELTA and AppLocale. 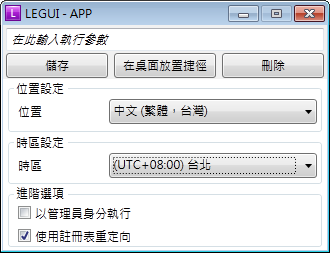 That is, to simulate the UI language, timezone, codepage etc. as another OS (For example, Japanese). In most cases, the executable, which is loaded using LE, will treat your OS as in the new language which is simulated to. This is mostly used when you are trying to run a application (Galgame, Online game, etc.) which can run only in a specificated region. Some antivirus software says that LocaleEmulator.dll is a virus. So you can add a trust item in your antivirus software, or simply remove all files of LE.